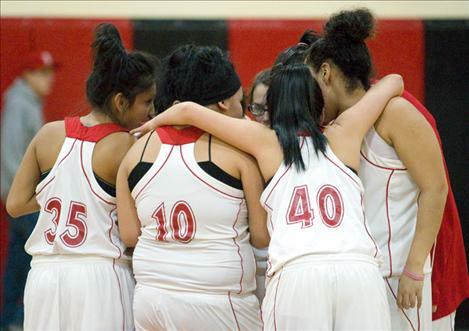 Above: The Lady Eagles huddle before tip-off of their home game against Victor last week. 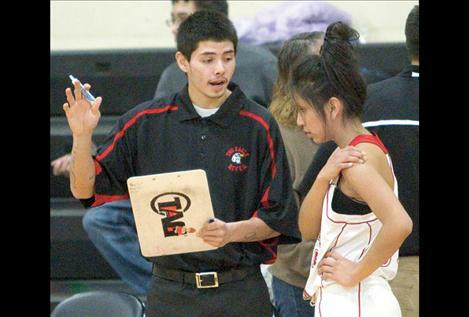 Lady Eagles assistant coach Artie Mendoza talks strategy with Ruby Saluskin before Friday night’s game.Mendoza played for the Two Eagle River boys’ basketball team last year. Senior Daryl Conko-Camel calls a play for her teammates as she brings the ball down the court. 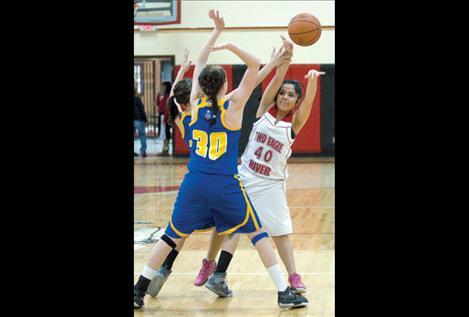 Freshman Tyra Michel grabs a rebound on defense during Friday’s game against the Victor Lady Pirates. 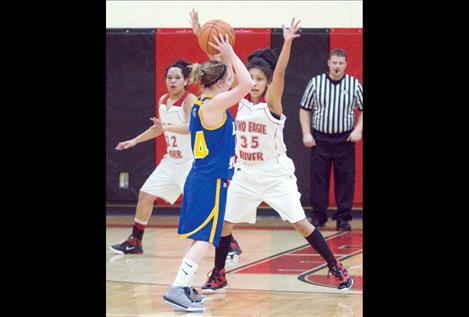 Misty Mendoza shoots a jumper during the Lady Eagle’s game against Victor Friday night. 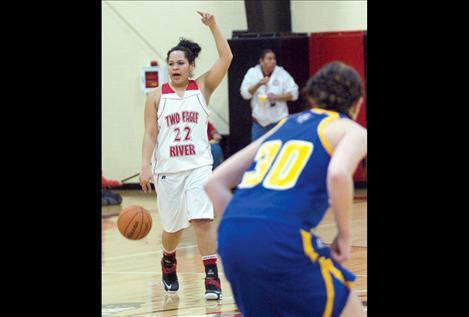 PABLO — “We’ve got our flow down,” Daryl Conko-Camel said of the Two Eagle River Lady Eagles’ basketball team. Conko-Camel, a senior, plays mostly guard, sometimes post wherever coach Brandon Burke needs her. Although the Lady Eagles lost by 20 points to Noxon on Jan. 17, Burke said there was “no bickering, no fighting,” among the teammates. Despite not winning, “Everybody had a blast last night (at Noxon),” Burke said. Many high school teams are made up of athletes who have played together for years. 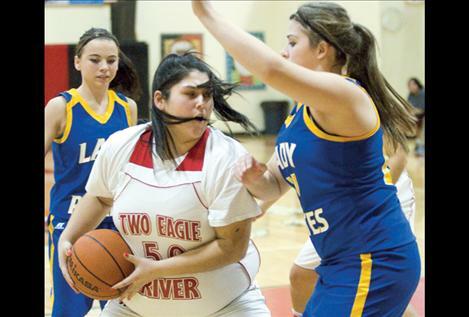 Since TERS only has grades 7-12, many of the Lady Eagles had never hit the hardwood together before this season. There are actually a lot of new girls, Burke said, girls who did not play last year and who play at all different levels. For example, Kaci Ducharme, an eighth-grader, is a Lady Eagle. Post Maklit Charlo, a sophomore, has played since eighth grade. Charlo noted this is the first year the Lady Eagles have played varsity teams. Last year, they pitted themselves against junior varsity teams. 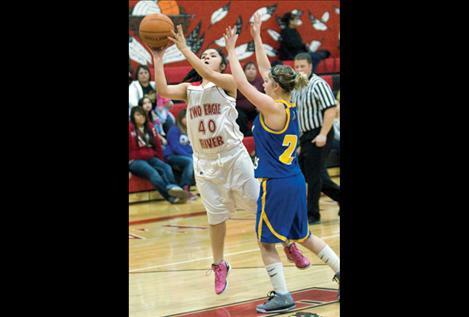 Burke looks at basketball as a supportive, therapeutic game for the girls. They have to learn sportsmanship, too. Burke said Conko-Camel is a team leader, plays offense and defense and knows all the plays. An up-and-comer is Misty Mendoza, who started playing last year. Playing point guard, Mendoza, also a good defender, “is a streaker on offense,” Burke said. 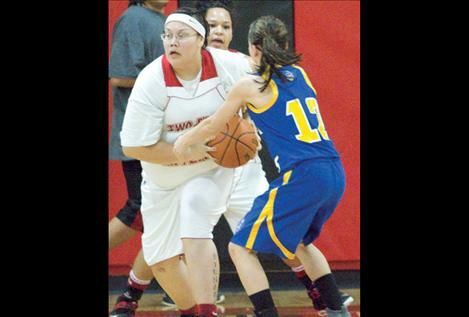 She got hot on offense and hit a couple of 3-pointers at Noxon. Ruby Salushkin has improved her ball handling and makes good passes. She’s also scrappy on defense, Burke explained. Charlo probably has the most potential of his post players, Burke said. Although she hasn’t come out of her shell, Burke thinks Charlo will be a dominant post player next year. Burke said Ma’Lee BigCrane, Brittany Robles, Ida Couture and Tyra Michel make up the rest of the team and have all improved this year. He was disappointed that Alabama Salushkin didn’t come out for basketball this year. Burke also complimented assistant coach Artie Mendoza, who played for the TERS Eagles last year. “He’s a great kid; he comes up with most of the plays,” Burke added. Artie’s role is the “bad cop,” Burke explained, and he really pushes the girls. With nine girls, and one who recently joined the team, Burke said they condition heavily since they don’t have a limitless bench. The Lady Eagles still have six to eight games before the divisional tournament, Burke said, and if the division has three seeds, who knows what could happen?